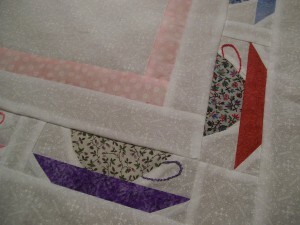 Browsing "DS Thistledown & Co"
Tea-Lightful Quilted and Bound… Time for Tea! Tea-lightful by Thistledown & Co has been quilted with swirls to represent steam rising. The binding was all machine stitched with a winding pink stitch. All the work is done and it’s time for a tea break with a couple muffins. Mmmm. And while I sip my tea and nibble on my muffins I’ll show you a few more patterns from Thistledown & Co.
Bertie The Butterfly is fluttering about against a background of flowers. This 9″ x 11″ quilt is made with fabrics printed from the Push-Button Prints CD. The Coneflower Calypso pattern is shown in two color ways. . . soft and pretty & bright and bold. A sheet of Whisperlite is included for the fusible parts of this project. When winter hits us full force and you are wishing summer were here, you can work on Beachwalk and escape for a bit. The center of this lap quilt (54″ x 60″) is a blanket with all the beach necessities surrounded by several pairs of brightly colored flip flops. Here are some no-calorie sweets. Lollipop Garden combines easy applique with a stacked coin border for a bright, fun quilt. 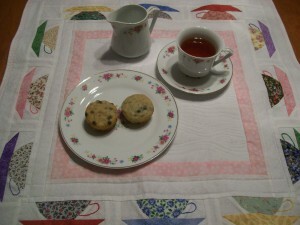 Well, the tea is gone, the muffins are but crumbs, so it’s back to the sewing room! The Thistledown pattern giveaway has ended. and Chocolate Chips have been awarded. The random number generator selected LouAnn’s comment as the winner. LouAnn said “Wonderful, inspirational, gotta-make-them-right-now patterns! Thanks for the chance to win!” She will be receiving all three patterns soon! Happy sewing LouAnn! The Tea-Lightful quilt top is finished! 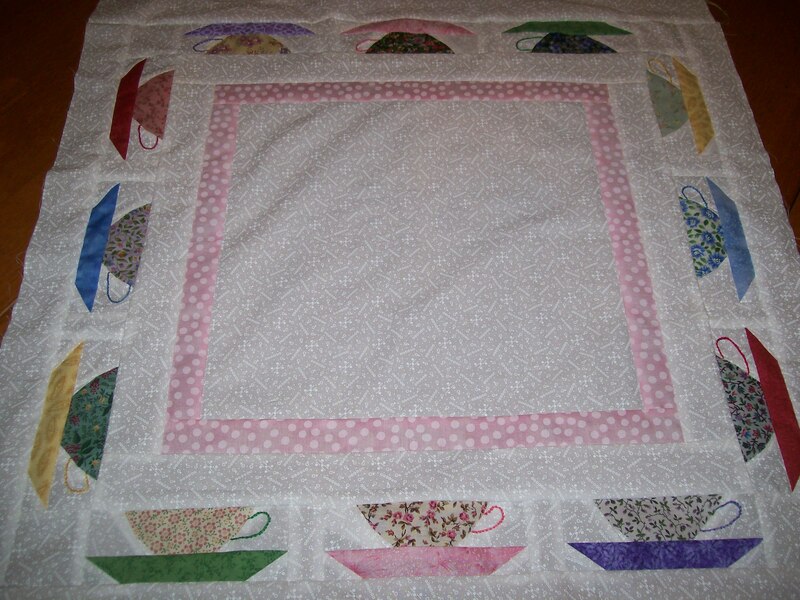 All the teacups added to the center block, all the borders attached. And all the handles are embroidered. Don’t look too closely at the handles :) I should have used the temple provided in the pattern but I got lazy and sassy and figured I could do it freehand. They did get better as I went but the first couple of handles look a little wonky. Next step is quilting…. hmm… what to do? 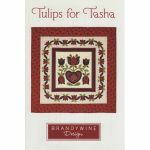 If you like this pattern take advantage of the 10% off coupon good on all Thistledown & Co patterns. Find the code in the previous post. And leave a comment there so maybe you can win the three patterns Thistledown and QuiltersWarehouse are giving away! Today starts a giveaway for three patterns by Thistledown & Co. One person will win all three patterns. And all this week there is a 10% discount on all patterns by Thistledown & Co.
Just as with paper dolls, these best friends can be dressed and redressed. Swap clothes and hairdos over and over. Any little girl would love to play with these and any grandma or mom would love to make these! Dolphin Delight is one block from the Florida Album quilt. You can choose to simple bind this and make a small wallhanging. Or make it into a pillow cover. But you might just fall in love with it and make the rest of the blocks. The pod of dolphins are splashing around. The pattern includes instructions for both needle turn & fusible applique. Beads to embellish the block are also included. Chocolate Chips uses color and value do all the work to create this fun looking quilt. I just love looking at this quilt. There are instructions for three sizes: lap, twin and queen. All three patterns will go to one winner. Leave a comment on this post before Friday midnight (central time). All this week you can get a 10% discount on all Thistledown & Co patterns. Coupon code is QS002. Valid today through the end of day Friday. The second pattern giveaway is over, but we have one more group of patterns by Thistledown & Co to giveaway. Check back later today for details…. and for a discount code good all week long on any patterns from Thistledown. The random number generator selected Jocelyn’s comment. Toy Box Treasures and Boo-Dazzled will soon be on their way to Jocelyn. Do you have a water cooler in your office? in your kitchen? Don’t miss the opportunity to personalize it and add a decorative touch. Thistledown & Co has four patterns for water bottle caps. Bubbles is swimming around with his friends, right at home with all the water. This would look great with batiks or hand dyed fabrics. Don’t forget the water bottle when you are decorating for the holidays. Rejoyce! features the wise men as they follow the star to Bethlehem. It’s a long way off, but when It’s Springtime you’ll be ready with this garden, complete with yo-yo flowers, embroidery and button embellishments. Flowers galore! For the summer holidays, you can add a patriotic touch to your water bottle with God Bless America. Uncle Sam is flanked by two kittys waving flags. Do you take your water bottle in to meetings or sew-ins or anywhere else and then wonder which water bottle is yours? These cute wraps will solve that problem and will brighten things up! Pattern includes four designs plus a ready-to-trace alphabet so you can add your name or any words you choose. So you can see, Linda’s patterns really are varied and these are an example of the fun practicality I mentioned earlier in the week. Don’t forget to leave a comment on our earlier post to have a chance to win two of Linda’s patterns. Like us on Facebook so you don’t miss anything. And stayed tuned…. more patterns to be given away next week and a discount on Thistledown patterns – come back to the blog for the discount code.